The active ingredient in magic mushrooms, psilocybin, is remarkably effective at reducing feelings of anxiety, depression, and other forms of mental anguish in cancer patients, according to a pair of new studies. New research published in the Journal of Psychopharmacology shows that a single dose of mind-altering psilocybin, in conjunction with psychotherapy, reduces depression, anxiety, and other emotional distress in patients with advanced cancer, while increasing feelings of well-being. Importantly, these effects lasted for months. It’s a potent example of how psychedelics could be used to treat various illnesses, and how the medical community’s squeamishness about these drugs—not to mention the various government agencies which have banned them—is in need of a serious re-think. Small trials have shown psilocybin’s promise in treating alcoholism, opiate addiction, and depression. This latest research offers some of the most compelling evidence yet for the use of psychedelics to treat complex and profound emotional disorders, particularly in patients with life-threatening illnesses. Researchers from NYU Langone showed that a one-time treatment with psilocybin quickly brought relief from emotional distress that lasted for more than six months in 80 percent of the 29 study subjects monitored. Participants were evaluated according to standard measures of depression and anxiety, such as blood pressure, heart rate, clinician-based tests, and self-reported questionnaires. A similar study from Johns Hopkins reached the same conclusion. Because psilocybin is a banned substance, the US researchers had to acquire special federal waivers to conduct the trials. 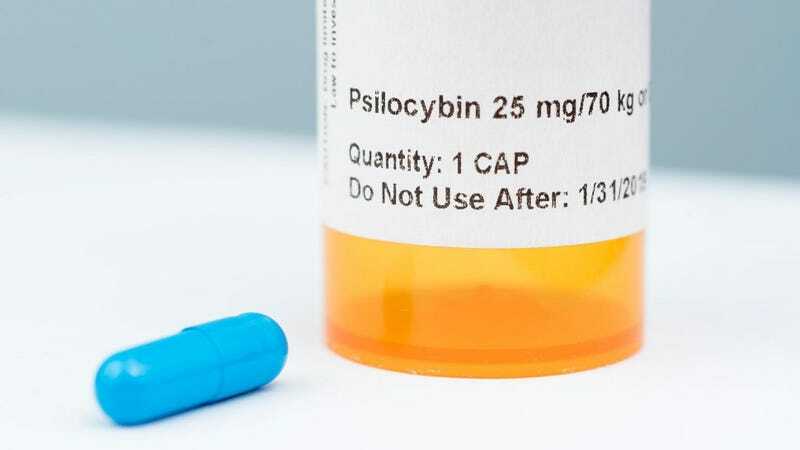 During the treatments, half of the patients were given a 0.3 milligrams per kilo dose of psilocybin, and half were given one of two placebos, either a super low dose of psilocybin or the vitamin niacin (which produces a “rush” that mimics a hallucinogenic drug experience). The researchers chose these particular “placebos” because if they hadn’t, it would have been glaringly obvious to the participants that they were being duped with a bona fide placebo, such as a sugar pill (as anyone who has ever done shrooms before would know, the effects aren’t subtle). During each session, participants laid on a couch, wore a blindfold, and listened to music. The researchers encouraged the patients to focus their attention on their inner experiences. Follow-up analysis showed that the single-dose treatment of psilocybin produced almost immediate results. In addition to quelling feelings of despair, anguish, and depression, the drug boosted measures of the quality and meaning of life, the acceptance of death, and optimism. Several patients reported feelings of spirituality, unusual peacefulness, and increased altruism. Side effects were few and minor, including nausea, headache, and some residual anxiety (many of these patients are dying of cancer, so shrooms shouldn’t be expected to alleviate all emotional stress). Roland Griffiths, who led the Hopkins trial, said the drug offers patients a sense of unity, and a feeling that everything is connected at some level. The researchers caution that patients shouldn’t medicate themselves with magic mushrooms without supervision by a physician and a trained counselor. “Psilocybin therapy may not work for everyone, and some groups, such as people with schizophrenia, as well as adolescents, should not be treated with it,” noted Anthony Bossis, a psychiatrist at NYU Langone and co-author of the new study.